Based in the Warminster ready meal production unit, the NH Case development kitchen sees the development process begin in one of two ways; either our Development Chef originates additional dishes for our range or he designs products following customer suggestions. Based on the brief recipe, samples are produced and sent to the customer for evaluation. Tweaks to the recipes are then implemented and new samples submitted. Once product specification and nutritional information is finally agreed, a product launch date is planned. Product Development then formalise the “recipe and method” to be put into production. Cooks and production team are trained, the Development Chef overseeing pre-production runs and testing. Once he is satisfied, the product is scheduled for full production, a process which he continues to oversee. A special range offering mini-pot portions of “refreshing summer flavours” for a large home delivery customer. Dishes include chicken, peas and mint risotto, lemon pepper chicken, sweet chilli pork, and asparagus, lemon and basil risotto. Adapting an existing range of products to meet nutritional requirements including salt reduction, sugar reduction, removal of transfats and increased protein levels. A new range of hearty soups that are satisfying and delicious meals on their own. 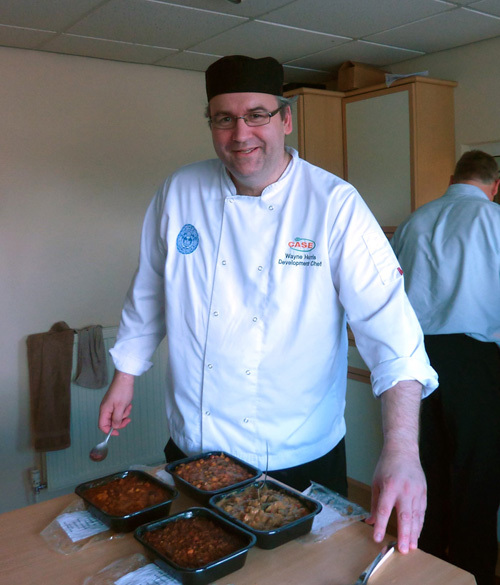 Flavours include sweet potato and coconut, pulled ham and pea, Scotch broth with lamb and barley and tomato and basil. Click on the recipes on the right for some of our latest dishes.